Astronomers using the National Science Foundation's 140 Foot Radio Telescope in Green Bank, West Virginia, were able to infer the amount of matter created by the Big Bang, and confirmed that it accounts for only a small portion of the effects of gravity observed in the Universe. The scientists were able to make these conclusions by determining the abundance of the rare element helium-3 (helium with only one neutron and two protons in its nucleus) in the Milky Way Galaxy. "Moments after the Big Bang, protons and neutrons began to combine to form helium-3 and other basic elements," said Robert Rood of the University of Virginia. "By accurately measuring the abundance of this primordial element in our Galaxy today, we were able infer just how much matter was created when the Universe was only a few minutes old." Rood and his colleagues, Thomas Bania from Boston University and Dana Balser from the National Radio Astronomy Observatory (NRAO), report their findings in the January 3 edition of the scientific journal Nature. Rood began searching for helium-3 in the Milky Way Galaxy in 1978. At that time, scientists believed that stars like our Sun synthesized helium-3 in their nuclear furnaces. Surprisingly, Rood's observations indicated that there was far less of this element in the Galaxy than the current models predicted. "If stars were indeed producing helium-3, as scientists believed, then we should have detected this element in much greater concentrations," he said. This unexpected discovery prompted Rood and his colleagues to broaden their search, and to look throughout the Milky Way for signs of stellar production of helium-3. Over the course of two decades, the researchers discovered that regardless of where they looked -- whether in the areas of sparse star formation like the outer edges of the Galaxy, or in areas of intense star formation near center of the Galaxy -- the relative abundance of helium-3 remained constant. By concurrently measuring the amount of hydrogen (also created by the Big Bang) in the same areas, the scientists were able to determine the relative abundance of helium-3. "Since stellar processes appear to have little or no impact on the amount of helium-3 in the Galaxy, we were able to deduce two very important things," said Bania. "First, since our current models predict stellar production of helium-3, then we will need to rethink our understanding of the internal workings of stars like our Sun. Second, since helium-3 has not been created or destroyed in our Galaxy in any appreciable amounts, then what we detected is most likely equal to the abundance of primordial helium-3 created by the Big Bang." The scientists were able to use this discovery to calculate how much "normal" matter was created during the Big Bang. (Normal matter is anything made of baryons, subatomic particles that include neutrons and protons.) The researchers made these calculations by taking what they know of the composition of the Universe today, and essentially running time in reverse. In this case, the ratio of helium-3 to hydrogen gives the ratio of baryons to photons (the density of radiation) just after the Big Bang. By using the rate of expansion of the Universe, given by the Hubble Constant, the scientists could then infer just how much normal matter was produced during the Big Bang. "Our findings for helium-3 in fact support other studies that also constrain the amount of matter in the Universe," said Balser. "Taken together, these studies show that the matter that makes up stars, planets, and the visible Universe can only account for a small fraction of what we observe as the effects of gravity in the Universe." Dark matter, which can be both baryonic (dead stars, rocks, etc.) and non-baryonic, and other as-yet-unidentified forces appear to be the primary sources of the gravity that holds galaxies, and the larger structures of the Universe, together. "The fact that most of the matter in the Universe is non-baryonic, that is to say not made of any particle we've ever seen on Earth, is a very exciting concept," commented Rood. The astronomers conducted their research using measurements at a frequency of 8.665 GHz (3.46 cm), which is emitted naturally by ionized helium-3. 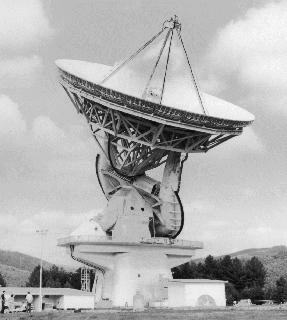 The 140 Foot Radio Telescope at the NRAO in Green Bank now is decommissioned after a long and highly productive career. "Though the 140 Foot Telescope enabled us to make remarkable observations," commented Rood, "we anticipate that the new Robert C. Byrd Green Bank Telescope will greatly increase our ability to continue this research."